GP>RN – Reading The Polls! An interesting poll in the Evening Standard has more than half the public thinking that the British economy would be either better off or no worse off if Britain were to quit the EU. 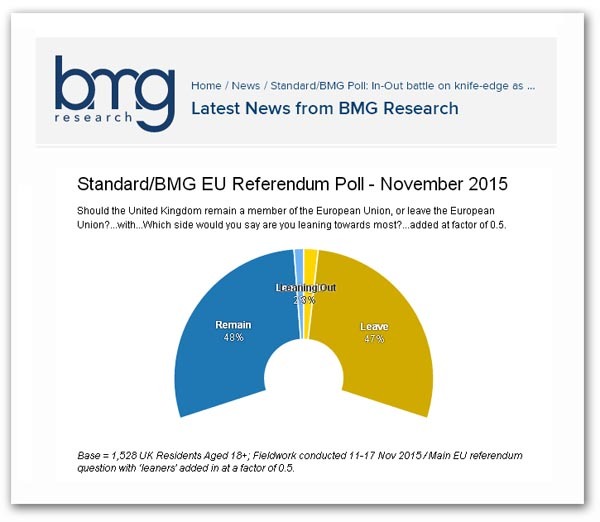 The polling company is BMG Research and the unmodified figures have 42 percent thinking that leaving the EU would harm the British economy. On the other side, 35 percent think Britain would be better off economically outside the EU while 23 percent think the economy overall would be neither better off nor worse off if Britain left. One might have thought that the “neither better off nor worse” respondents were actually “don’t knows” but BMG Research seem to think their input is relevant. Added to the 35 percent “better offs”, the two make 58 percent. Contrasted with the 42 percent, that gives the majority to those who are unworried by the effect of leaving on the economy. More interesting though is the relationship between these data and the raw voting intention figures. These have the “remains” and the “leavers” equal on 39 percent while the “don’t knows” and “won’t says” come in at 22 percent. The immediate point is that there doesn’t seem to be any direct correlation between either side and their concern for the economy. While 39 percent want to leave, 58 percent are comfortable with the effect on the economy. Then 39 percent want to remain, yet 42 percent think the economy is a big deal. Arguably, those who are unworried about the economy ought to be happy to see us leave, but the absence of the relationship suggests that the link between economic outcome and voting intentions might be tenuous. In terms of expectations of Mr Cameron’s “renegotiations”, getting the right to cut immigration from EU countries has 52 percent of respondents thinking this is “very important”, cutting red tape affecting British firms has 44 percent, opting out of “ever closer union” 33 percent, letting groups of countries combine to block new EU laws they think would be harmful, 30 percent and letting individual countries veto new EU laws they think would be harmful gets a score of 39 percent. Clearly, immigration is a key issue, a finding reinforced by the finding that 80 percent of respondents think that it is the top issue – coming just at the time when record immigrationis being reported. However, things are not quite what they seem. While the polling company (and the Evening Standard) make a big deal about the declared respondents being at parity, the fact that we have 22 percent uncommitted is significant. These are the people who are going to decide the referendum. And they are the one who are most likely going to be most influenced by the “renegotiation” outcome. This we can surmise from another poll in the Evening Standard, published last November. This one was conducted by YouGov: it had 45 percent “remains” and 37 percent “leavers”. But, according to that poll, if Mr Cameron delivered “significant reforms”, such as “placing a limit on the number of immigrants allowed to enter Britain”, the “remains” climbed to 58 percent and the “leavers” dropped to 25 percent. On the other hand, if the talks failed, the situation reversed. A majority of 43 percent would vote to leave, while only 34 percent would want to remain. From this, we could play with the hypothesis that it is not current expectations that will determine the referendum result but the outcome of the “renegotiations” – or the perception of what has been achieved. Theoretically, it could turn a 33 point victory for the “remains” into a nine-point defeat. In such a scenario, a successful campaign strategy will be one which is able to demolish any claims made of such negotiations. The better the demolition job, the more likely is that we will win. But, following on from the piece yesterday, I am getting a sense that the mood music could be shifting in our favour. According to the Financial Times, amid all the other strains and stresses affecting the EU, tensions over the Paris terror attacks and Europe’s migrant crisis is affecting the Franco-German relationship. There is also tension spilling over between Germany and Poland, exacerbated by the Polish refusal to take Syrian refugees, when Mrs Merkel is counting on EU burden-sharing to defuse the growing political tensions within Germany, caused by the migrant issue. The Germans note bitterly that Poland continues to receive huge subsidies from the EU, much of that funded by German taxpayers – and that millions of Polish citizens have moved to other EU countries. The fact that the Polish government has said that it will no longer fly the EU flag at press conferences, has only added to the bitterness. The Poles, for their part, accuse Mrs Merkel of unilaterally changing EU migration policy, by announcing an open-door policy for Syrian migrants. This rising tensions between Germany and its eastern and western neighbours come in the wake of the euro crisis – which had already led to an estrangement between Germany and much of southern Europe. Meanwhile, Britain’s behaviour over the membership issue has long been a source of frustration in Berlin, adding to Germany’s irritation. As one German civil servant says: “The European house is burning down and Britain wants to waste time re-arranging the furniture”. The FT remarks that the Merkel years have seen Germany emerge as the undisputed leader of the EU. But the combination of migration, terrorism, Brexit and the euro also mean that Germany looks more isolated from its European partners than for many years. And that “isolation”, if it is real and continues, cannot help but have an effect on Britain’s renegotiation prospects. Mr Cameron needs a supportive Germany, with Merkel at the helm, to manage the renegotiation theatre, and deliver the promise of a treaty at the right time. This is especially the case if the Guardian has got it right. It tells us that the French are said to be cutting up rough on several of the UK’s negotiation fronts. It is stating that it will be almost impossible for Cameron to secure the “permanent, legally binding, irreversible” changes the UK is demanding without rewriting the Lisbon treaty, which cannot be done. This we already know, but of more concern is the UK’s demand that the EU be declared a “multi-currency union” – the essence of the “two-tier” Europe. This, apparently, is also being rejected by the French. They are concerned about the longer-term impact of a binding deal that ties the hands of the eurozone in a concession to Britain. If nothing else, this adds to the uncertainty, and makes it more difficult for the Prime Minister to finesse his end game. It’s far too early to tell yet, but if someone suggested that the game could be moving in our direction, I would not be the first one in the line to disagree.